Acheson Creations gives your 15mm minis a place to hide out and settle in with their Horizontal Timber Fort set. 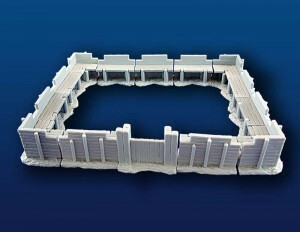 Acheson Creations has released the next in its 17th/18th Century category of products, the Horizontal Timber Fort Set. Modeled in 15mm (1:100 scale), this large piece is 26cm (10 inches) by 19.7cm (7 3/4 inches) on the inside and shows excellent detail.